The dicynodonts were the most successful of the therapsids in terms of phylogenetic longevity, numbers of individuals, and the extent of distribution over continental areas. In fact they were the most successful and wide-ranging group of plant-eating animals of the time. They first appeared in mid Permian times (Wordian epoch) with the small Eodicynodon, and evolved in a remarkably uniform structural pattern, as seen in Dicynodon, through the Late Permian and the whole of Triassic period. During late Permian times they were among the commonest of all tetrapods, at least as indicated by the fossil record, and a large number of different lineages existed side by side, from small mole-like burrowers to giant ox-sized browsers. They were greatly decimated by the increasingly harsh conditions of the terminal Permian, and only two lineages, the medium-sized Lystrosaurus especially adapted not to swamps, as previously thought, but to arid conditions) and the tiny myosaurs, survived into the Early Triassic. The myosaurs eventually died out, perhaps through competition with other herbivores. The lystrosaurs evolved into the giant and very successful Kanneymeriids, pig to rhino sized animals that continued to the end of Carnian epoch (Late Triassic period). The dicynodonts as a whole lasted some 50 million years, and the only group of therapsids to outlive them were the cynodonts, which were the direct ancestors of the mammals. It is in the skull that the dicynodonts show their greatest specializations. There was no other quite like it, certainly not among the therapsids (although the large herbivorous rhynchosaurs also developed a similar beak). The advanced development of their skulls and jaws was the main factor in the success of these animals. 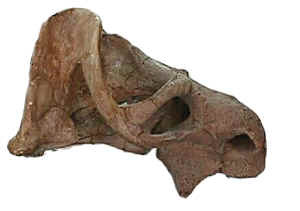 The temporal openings at the back of the skull that are shared by all synapsids were greatly enlarged, so that the remaining bone formed long arches. These large openings supported very powerful jaw muscles. The dicynodonts skull is striking because of its light open construction and the presence of long, bony bars rather than broad plate-like areas behind the eye. The hinge (see Emydops jaw movement, right) between the lower jaw and the skull permitted the jaws to move forward and backward, with a strong, shearing action. See images at Dicynodonts - the Two-Tuskers for some variations on the basic dicynodont jaw mechanism. The dentition of these therapsids was unique. The front of the skull and the lower jaw were narrow and beak-like. Apart from a pair of large, upper tusks in some species, teeth were reduced to tiny remnants or were completely absent. In many dicynodonts the tusks are present in about half of the individuals, indicating that these were probably sexual characters, presumably present in one gender morph and absent in the other. The upper and the lower jaws were certainly covered with horny beaks in life, like the beak in turtles and, it can be assumed, in the Triassic rhynchosaurs. The body was short and broad, and was supported by strong limbs thick limbs that supported the body in the typical therapsid fashion. The ilium as expanded and strong, and likewise he shoulder girdle was large and strong. It seems that the hind-limb was held straighter than the forelimb (at least in the case of the Triassic Dinodontosaurus), making them slow plodders but nevertheless with a very powerful thrusting movement. The tail was short, even more so than in other types of therapsids. In size the dicynodonts ranged from small rodent-like animals about 20cm in length, such as Cistecephalus and other small Permian forms, to giant, massive animals, such as the late Triassic genera Stahleckeria (known from Brazil) or Placerias from Arizona), which were as big as the largest dinocephalians reaching weights of over a tonne). MAK000813, ATW040201. It has become increasingly clear that, as might be expected from this pattern of evolution, the classical taxa of dicynodonts are actually evolutionary grades in a continuous series. That is, the Kannemeyeriidae evolved from Pristerodontia, who evolved from Diictodontia, and so on. Surkov et al. (2005). So as not to lose these useful benchmarks of the course of dicynodont evolution, we have taken the liberty of redefining them as successive crown groups defined by their eponymous genera plus the highly derived dicynodont, Ischigualastia. Thus Kannemeyeriidae = Kannemeyeria + Ischigualastia, Pristerodontia = Pristerodon + Ischigualastia, etc. ATW050828. Dicynodontia: Ischigualastia > Galepus. Examples: Eodicynodon, Cistecephalus. Range: Middle Permian to Late Triassic. Characters: postorbital contacts squamosal [C88]; specialized jaw (see discussion, supra); squamosal elaborated to broad lateral plate of bone [C88]; temporal fenestrae very long and large [C88]; braincase sutured to pterygoids, without moveable basicranial articulation [C88]; secondary palate formed from premaxillae, maxillae, & palatines [C88]; pterygoid transverse flange absent [C88]; internal nares open behind midpoint of skull [C88]; premaxillae & dentaries fused at symphysis [C88]; keratinous beak present [C88]; teeth eliminated except canines (lost in some forms) with massive canine bosses at anterior maxilla [C88]; body short & stout [C88]; forelimbs sprawling, but hind limbs erect [C88]; phalangeal formula 23333 [C88]. References: Carroll (1988) [C88]. ATW020527. Links: Diictodontia; Synapsida.htm; South African Museum - Fossil Reptiles of the South African Karoo; Two life-size models of Diictodon; Biology 356; South African Museum - Trace Fossils of the Ancient Karoo; National Geographic Magazine @ nationalgeographic.com; Fossil Feature - A local scene from about 230 million years ago...; therapsid5a; Representative Faunas of the Four Lowland Empires of the Late Permian and Triassic of Southern Africa. ATW020809. Pristerodontia: Pristerodon + Ischigualastia. Examples: Pristerodon, Kingoria, Jachaleria. 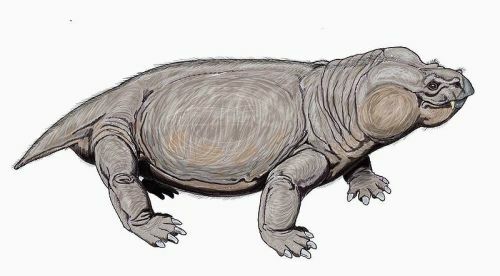 Phylogeny: Diictodontia : * : Lystrosaurus + (Jachelaria + Kannemeyeriidae). Lystrosaurus: Cope 1870. L. ("Dicynodon") murrayi Huxley 1859; L. "Dicynodon") curvatus Owen, 1876; L. declivis ("latirostris") Owen, 1860; L. georgi, Kalandadze, 1975; L. hedini Young, 1935; L. mccaigi Seeley, 1898; L. oviceps Haughton, 1915; L. platyceps Seeley, 1898; L. rajurkari Tripathi & Satsangi 1963; L. robustus Sun, 1973; L. shichanggouensis Cheng, 1986; L. weidenreichi Young 1939. Range: Late Permian to Early Triassic of South Africa, Antarctica, India, China & Russia. Phylogeny: Pristerodontia : (Jacheleria + Kannemeyeriidae) + *. Characters: medium- to large-sized [BS00] [S+05]; snout short & very deep, extended ventrally [BS00] [S+05]; snout slopes forward [BS00]; anterolateral corner of snout angular [S+05]; orbits high [BS00]; nares directly anterior to orbits [BS00]; choana only slightly constricted [S+05]; rugose portion of palatine narrow & small [S+05]; ectopterygoid absent [S+05]. Comments: Now you know where Alan Busby got his idea for the Demu. Links: LYSTROSAURUS; Lystrosaurus; Lecture 9 - Triassic: Moenkopi, Karroo, Ischigualasto; Lystrosaurus sp. ; triassic image page 1; Paleontology and Geology Glossary: L; National Geographic Magazine: July 1996 @ nationalgeographic.com; kf_24b.jpg; Dinosaurios: Lystrosaurus; Marine and terrestrial geology and geophysics; lystro2; Lystrosaurus; ???????? ; South African Museum - Fossil Reptiles of the South African Karoo; lystro2; Triassic; LYSTROSAURUS (long) (was Re- Mammal - Like - Reptiles); Lystrosaurus image of fossil in situ); Glossary; lystro2; ALBANY MUSEUM - KAROO FOSSILS; Triassic; triassic%20page%201.html. References: Battail & Surkov (2000) [BS00]; Surkov et al. (2005) [S+05]. ATW050828. Jachaleria: J. colorata Bonaparte 1971. J. candelariensis. Range: Late Triassic of South America. Phylogeny: Pristerodontia :: Kannemeyeriidae + *. Comments: These giant dicynodonts constitute some of the last known members of the dicynodont line. J. colorata is the only tetrapod collected from the base of the Los Colorados Formation, which immediately overlies the Ischigualasto. J. candelariensis is found together with the herbivorous cynodont Exaeretodon sp. Image: Jachaleria skull (60 cm) from the Universidade Federal do Rio Grande do Sul, Instituto de Geociências. Links: UFRGS - Paleovertebrates; UFRGS - MSc THESES/PALEONTOLOGY. MAK991017. ATW020527. Phylogeny: Pristerodontia :: Jachaleria + * : Kannemeyeria + (Placerias + Ischigualastia). Range: Early Triassic of South Africa, South America, India & possibly Australia. Phylogeny: Kannemeyeriidae : (Placerias + Ischigualastia) + *. Comments: This ox-sized dicynodont was a common herbivore in Spathian and early Anisian times. It is known from South Africa, Argentina, and possibly India, but in all likelihood had a world-wide distribution. Links: Paleontology and Geology Glossary: K; South African Museum - Fossil Reptiles of the South African Karoo; BPI Palaeontology (Wits University; University of the Witwatersrand, Johannesburg); paleontology; fossils; South Africa; Fossil Picture Gallery; Kannemeyeria; Kannemeyeria Korean); Abstracts, Ag - An; PANGEA Italian); models.html. ATW020527. Range: Middle Triassic to Late Triassic of North America. Phylogeny: Kannemeyeriidae :: Ischigualastia + *. Characters: to 3.5 m & 1000+ kg; hippo-like overall appearance. Links: Walking with Dinosaurs - Fact File: Placerias; Petrified Forest National Park-Reptiles And Dinosaurs; Dinosaur museum (Chinese); Placerias - Paleontology and Geology Glossary; Placerias, a later herbivorous therapsid. Note the unusual tusk-like teeth. Middle Triassic, Arizona; Paleo Photos; Placerias, Drawing Nature Studio. ATW020527. Ischigualastia: I. jenseni Cox 1964. Phylogeny: Kannemeyeriidae :: Placerias + *. Comments: An enormous dicynodont, with a short, high skull, and lacking tusks. It was a common member of the local fauna, although not as abundant as the medium-sized herbivores Scaphonyx and Exaeretodon. The only danger to such a huge animal was the almost equally large carnivorous pseudosuchian Saurosuchus. It is likely that pressure from this predator pushed Ischigualastia into extinction, for it becomes less common and finally disappears in the higher levels of the Ischigualasto Formation. 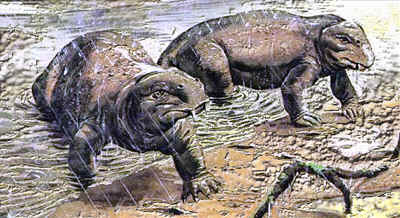 A somewhat smaller relative or descendant, Placerias, survived in Laurasia. Links: Lecture 9 - Triassic: Moenkopi, Karroo, Ischigualasto; ischifauna. MAK991017. ATW020527.